Prev Post You Can Pin Important Post to Trackers! 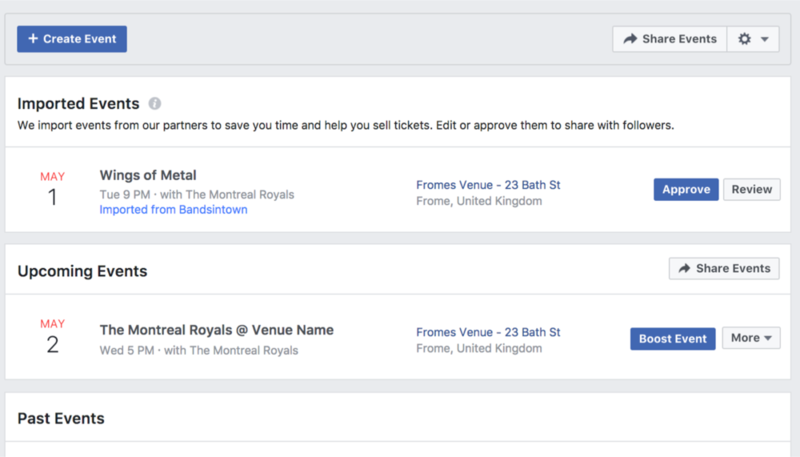 Facebook and Bandsintown have partnered to save artists time, and increase event exposure to bring more fans to your shows. We are happy to announce the export capability from Bandsintown to Facebook Events has been reactivated. Your Bandsintown events are now exported again to Facebook. If you have any question, please read on the article below. Thank you for your patience and your trust! Facebook and Bandsintown have partnered to save artists time and increase event exposure to bring more fans to your shows. Once a day, Facebook scans Bandsintown events and populates the Events tab on artists' Facebook Page as part of the Facebook Events service. If an event does not already exist on the artist's Events tab on their Facebook Page, the event is imported by Facebook and added to the Imported Events section of the Events tab. At this point, the event is not yet visible to the public: it must first be reviewed by one of the Facebook Page administrators to either approve or edit the event. When approved, the event becomes visible to the public on the artist's Events tab on their Facebook Page. If the event is edited or deleted on Bandsintown, this change is reflected on the artist's Events tab on their Facebook Page within 24 hours. Note however that edits made to the event instance on Facebook Events will not transfer over to the Bandsintown event. Similarly, events created on Facebook Events cannot be exported to Bandsintown. Should you wish to disable this export capability from Bandsintown to Facebook Events, Bandsintown Manager allows you to turn it OFF. Go to your artist's Settings, and under the Events tab, turn OFF the toggle for Export to Facebook Events. Your preference is recorded immediately after changing the setting but it may take up to 24 hours to completely process because Facebook scans our events every 24 hours. On the Events tab of your Facebook Page, you will see the events from Bandsintown under the heading Imported Events. Artists and venues have the ability to choose whether to add the event as is by clicking on "Approve" or they can make edits by clicking "Review". Once you click "Review" you can make any edits including image, date and time, location, etc. After you click Approve, the event will go under the Upcoming Events heading in your Events tab. If you want to edit the event after approving it you can hover over the Event Name in your Events tab and a box with an "Edit" button will pop up. You can also click on the event and on the event page itself you will see an "Edit" button in the top right corner of the event. If you want to remove the event, you can click "Cancel this Event" in the bottom left corner of the Edit window. Please note you can only cancel the event after you Approve it. Please note that only artists and venues who are linked in the event have these editing capabilities. Make sure to log in to Bandsintown Manager to start exporting your events to Facebook Events!